With the economy struggling and the recent government shutdown, we would like to extend a special invitation to those federal employees and their families affected by the shutdown. Our Food Pantry meets the needs of families on a weekly basis. Open each Friday at 8:30 am, the pantry supplies free canned and packaged food along with some vegetables, breads, meats, and dairy products. In addition, there is a weekly Bible Study (in Fellowship Hall), available for all, during the hour prior to food distribution. If you would like to contribute to our food pantry you may do so by donating food items as well monetary donations. These items can be dropped off at our church office, Monday through Thursday from 8:30 am to 3:30 pm. 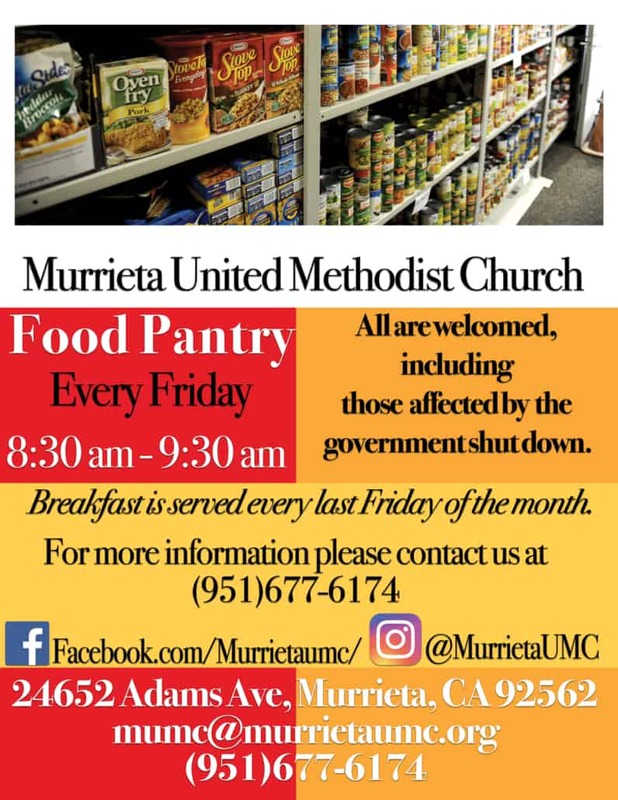 For more information on the food pantry, contact Ann Hartwig or Kathy Pyle at foodpantry@murrietaumc.org.